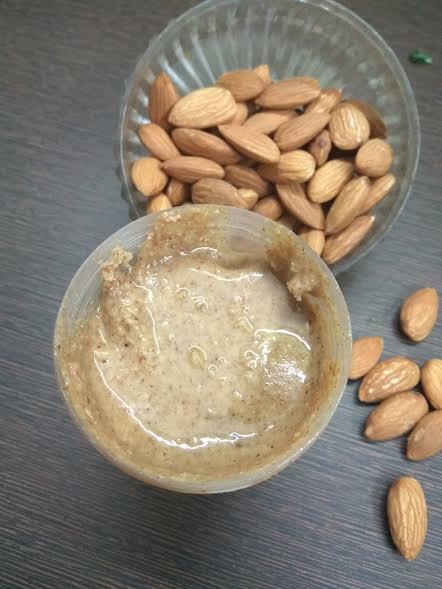 Want to know how to make almond butter at home? It's quick, it's easy, and oh so yummy! Did I say it's healthy? Desserts - the very word makes our mouths to water, isn't it? The first thing that comes to our mind is the rich, creamy, luscious texture of ice creams and kulfis, and of course sweets. After all desserts are made to be indulged in. But what about weight watchers and health freaks? We, too, love desserts and keep watching our calorie intake. Of course, we do not want to indulge too much in sweets because they are loaded with fat and sugar - this is exactly what makes them lip smacking. But ice creams demand to be savored - no matter whether it is shrieking hot or shivering cold outside. I enjoy ice creams even when it is chilling outside! Like you, even I love to indulge in sweets, kulfis, ice creams, and desserts of all kinds. But yes, I do want to keep an eye on my fat and sweet intake. After all, health comes first. But for those days when you really want to indulge in some form of dessert, I have shared a few healthy recipes that can quench your cravings! Yay!! This time again, I have come up with another healthy dessert, which was an experiment in the making. Had decided to experiment with a unique blend of almond butter, poppy seeds, and oatmeal with milk. I wanted to make some kind of healthy shake or smoothie. But the creamy texture tempted me to give it the shape of a kulfi. 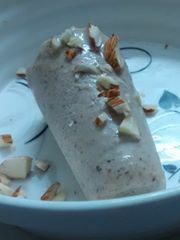 When the almond butter kulfi was set, it amazed me with its taste and texture. I experiment with minimum amounts, so I could make just one kulfi. Never mind, even one is enough to satiate cravings of us two - hubby and me!! Hubby is not too fond of desserts, especially kulfis. 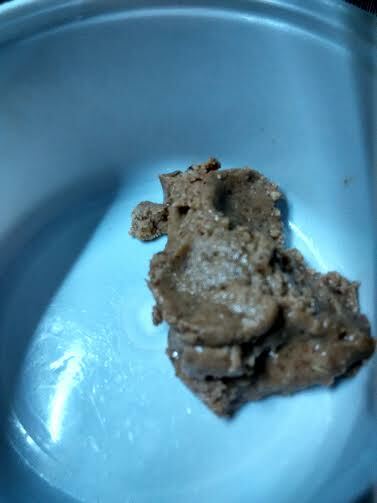 But the sheer look, aroma, and texture of this unique almond butter kulfi tempted him to taste the same. Well, initially he couldn't understand what it was made of. Surprised he was, since I do not eat chocolates and knows well that I would never add them to any recipe. 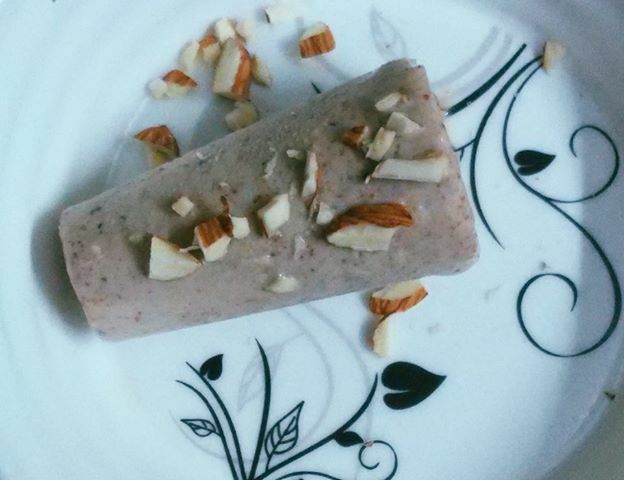 Then I solved the riddle - breaking open my silence on the unique kulfi ingredients. Na, he is used to such experiments now! Now you must be wondering why I added almond butter. works as a great substitute to butter/ cream - why should we add cream when we have a healthier alternative? Almond butter is super healthy, rich in taste, and of course addictive.Try a recipe with almond butter once, and you cannot stop at experimenting with this healthy ingredient there. I, too, started using almond butter recently. The first time I actually made it at home was when I wanted to try the 2-ingredient nana ice cream. 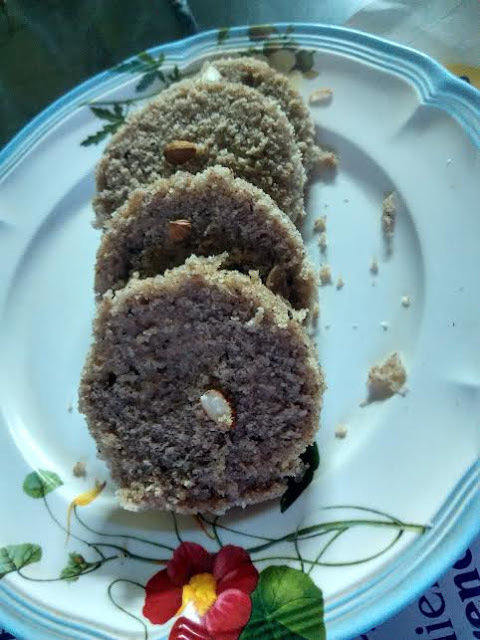 It was a super hit recipe with my friends. I got inspiring feedback from all corners. Yes, I was extremely happy with it. Next time, I included almond butter in a cake along with oil. The almond butter eggless atta cake was loved by one and all. The aroma of an almond butter cake in a mug or pan makes it different from others. You do not need to add any flavoring agent or spice to add to its aroma! Doesn't that sound good? Almond butter cookies with oatmeal was another of my trials with this buttery mixture sourced from roasted almonds. Even the almond butter recipe is simple and quick. 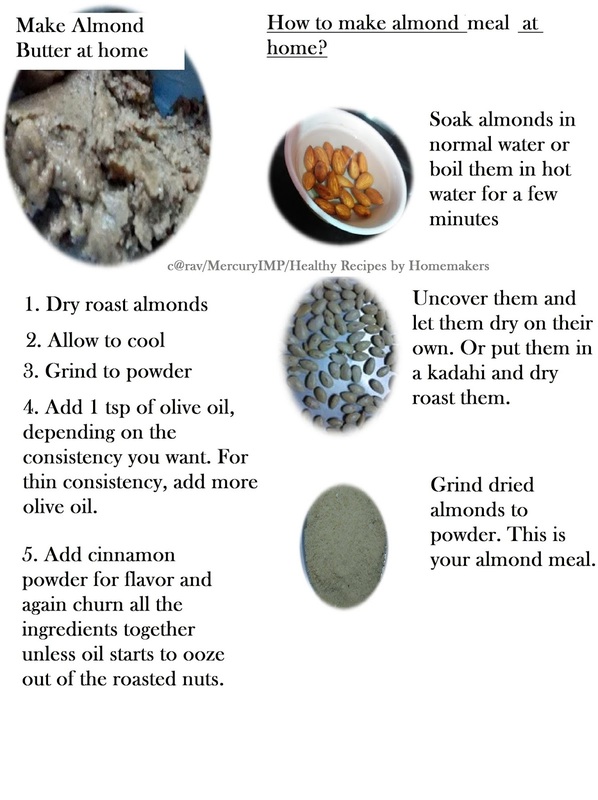 Here is how you can make almond butter at home. Clean 15-20 almonds or wash them quickly. Dry roast them until they turn brownish. Next, take 1/4 tsp of olive oil or any other oil. You may add more depending on the consistency you want. I kept it thick, so added only 1/4 tsp. Churn them up along with oil in a grinder. Keep processing unless you get the oil oozing from the mixture. You may add a hint of cinnamon to add to the flavor. This tastes so chocolaty that you will be tempted to savor almond butter at this stage. If you can control yourself, well and good. If not, then you will have to make another batch! Yes, this is seriously addictive!!! 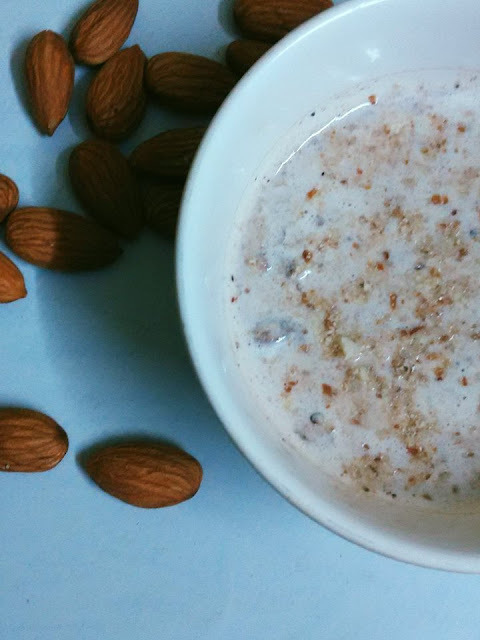 Boil almond butter in a glass of milk and it makes a delicious almond, chocolaty milkshake for kids and elders alike. You will thank me for this recipe!! Yay! Compared to peanut butter, almond butter has less calories and does not raise bad cholesterol. Rich in calcium & copper that facilitate brain cell communication, keep your muscles and skeleton strong . Copper helps in producing melanin, which is crucial for skin rejuvenation. protect your skin from the harmful effects of the sun by chewing a few almonds every day. According to Livestrong, "Each 2-tablespoon serving of almond butter contains 111 milligrams of calcium, or 11 percent of the recommended daily intake, as well as 299 micrograms of copper, or one-third of the daily requirement." Rich in magnesium and vitamin E that help in synthesizing fatty acids required by the body for energy storage.Vitamin E is good for skin and supports cell communication. If you consume 2 tbsp of almond butter daily, you can boost your vitamin E intake. Rich in dietary fiber and healthy unsaturated fat. Healthy fats in almond butter help boost your cardiovascular health, improve good cholesterol levels, reduce bad cholesterol, and lower risk of coronary heart disease. If you take 2 tbsp of almond butter daily, you can improve your fiber by 3.3 grams. Let's come back to the ice cream recipe. When you try this almond butter ice cream, you will quickly realize that nut butter-based kulfis are simple to churn out and use a few basic ingredients that are easily available on shelf. But churning out almond butter does require some patience. The end result would surely pay of soon when you get to relish the most delicious, nutty, creamy ice cream with almond butter. Trust me almond butter makes the most delicious ice creams that you would love to indulge in without worrying about your calorie or fat intake. Pair it with one or more fruits of your choice and indulge in healthy eating. Make almond butter. Keep aside. Add almond butter, honey, oatmeal or powdered oats, and walnut to the poppy seeds paste and run the food processor until everything mixes well. Add milk and churn again until the concoction is creamy and thick. Do not be surprised if you are tempted to taste the shake at this time. I too couldn't resist the temptation. Drink it as such or if you have patience, pour the mixture into kulfi moulds and set for freezing. Wait for 3-4 hours before you can get to taste this luscious, creamy, and delectable blend of almonds and poppy seeds with the goodness of oats. Do not forget to garnish with slivered almonds, so you can enjoy nutty bites. You may want to try 2-ingredient nana ice cream that uses almond butter. Check the recipe here. If you have a good amount of almond butter in stock, do try the 2-minute no oil. eggless almond butter cake. The recipe is here. Do not forget to hover over my 50+ oatmeal recipes if you are a health freak.